Jester Harley's Manuscript Page: Mary E. Lowd explains Otters in Space! Mary E. Lowd explains Otters in Space! When I heard about Mary E. Lowd's Otters in Space series, I absolutely had to have her on my blog. I mean, come on, otters in space! Please! Tell us everything! My favorite books as a kid were all about talking animals. As I got older, it got harder to find those sorts of books. Sure, there's the occasional piece of science-fiction with animal-like aliens or off-beat literary novel from the point of view of an animal, but, mostly, talking animals are seen as kid-stuff in our culture. So, when I set out to write a serious, hard science-fiction novel featuring talking otters as the main characters... Well, I was breaking new ground as far as I knew, and I had to make up the rules as I went along. Since then, I've learned that there's actually a name for the genre of fiction I was craving, and there's a whole community of readers, writers, and publishers who've put a lot of thought into how that genre works. I was ecstatic when I discovered the furry genre. Finally, I wasn't alone, writing about otters with spaceships. There are a couple of different kinds of furry fiction. Perhaps the most mainstream is 'the secret life of animals.' These stories are usually set in our normal world -- talking animals co-exist with humans who are simply unaware of the dramatic tales unfolding around them. (E.g. Watership Down by Richard Adams and Charlotte's Web by E.B. White.) Animals in these stories are often only slightly anthropomorphic. They can think and talk like humans, but they're otherwise normal animals. When writing speculative furry fiction, it's possible to fall into these extremes. You could tell the story of the first colonists on Mars from the point of view of their pet cat. Or, the first colonists on Mars could be cats with no explanation given for their furriness. However, I love the stories that fall in-between, and, I like it best when those stories have an answer to the obvious question: why can the animals talk? This question has been explored so much by the furry writing community that some people feel it doesn't matter anymore, much like the question of faster than light travel in mainstream science-fiction. How does the FTL drive work? Who cares? It just does. However, the type of FTL drive in a sci-fi universe determines the sorts of stories that can be told there. Similarly, the type of anthropomorphic animals determines a great deal about a sci-fi universe's history and culture. So, it's worth knowing the tropes. The oldest trope is parallel evolution. See, those golden-furred, feline bipeds who live in family groups with one male figurehead where the females do all the work... Those aren't lions. They're aliens. From a different planet. They just happened to evolve to be really similar to lions. (E.g. The Pride of Chanur by C.J. Cherryh.) This is a great trope. It's easy to use and widely accepted. A final possibility is that the animals actually are humans who have drastically modified themselves. (E.g. The Book of Lapism by Phil Geusz.) In this case, the species of animals will be chosen by individual characters for personal reasons. Individuals who choose to modify themselves so extremely are likely to be rich, eccentric, socially outcast, or part of a fringe subculture. And, of course, all of these answers can be adapted easily to fantasy universes by substituting science with magic and scientists with wizards. As you can see, explanations have been developed that will fit anthropomorphic animal characters into almost any piece of speculative fiction. And, from fantasy to space opera to near future hard sci-fi, most speculative fiction can benefit from the color and texture added by a few talking animals. Besides, they're just fun to read. You can learn more about Mary E. Lowd by visiting her website. 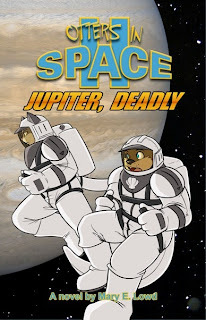 You can purchase the Otters in Space books from Fur Planet and Amazon. They really are fun to read. I haven't given much thoughts to anthropomorphism previously, but I remember in childhood, there was always a deep sense of security and warmth in reading about talking animals. It was "If those animals could make things work in their world (go to school, make friends in the woods, come home to Pa and Ma who go to work/stay at home to cook), I could, too, in mine." And I know of kids who carry their love for animal-fiction on to middle-grade levels. Integration with the sci-fi genre just adds more brilliance to the imaginative space! My type of book. I'll have to look out for it. I'm adding this to my wish list.